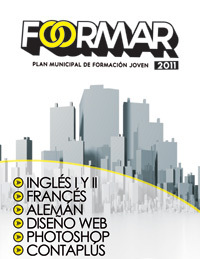 Formar 2011 organized by Marbella Town Hall is offering courses at very reasonable prices in language and computers in both San Pedro and Marbella. The language courses are offered for beginners and intermediates in German, French and English. The computer courses offered are Contaplus (an accounting software solution for small businesses which includes tax features and handling data for other legal requirements), Photoshop and web design. April 1 - May 13: Class starts on May 16 and ends July 26. July 1 - 25: Class starts on July 26 and ends October 5. September 1 - October 1: Class starts on October 6 and ends on November 21. April 1 - May 13: Class starts on May 16 and ends June 29. July 1 - July 24: Class starts on July 25 and ends September 8. September 1 - October 1: Class starts October 3 and ends November 22. This is a great opportunity for you or your children to either learn a new language or practice your Spanish at the same time as learning a new computer skill. Classes take place in the second half of the day anywhere between 4:30pm and 9:45pm. Click here to read more (in Spanish) and download a PDF registration form.